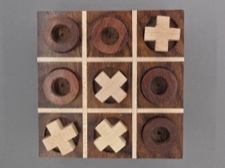 What a great idea - a travel size tic tac toe! 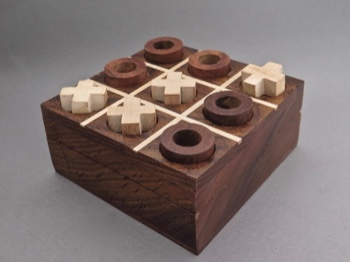 This game is a handmade wood version of the classic paper and pencil game. 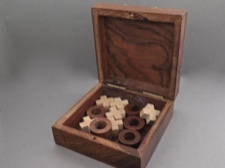 It has a Rosewood hinged box with wood x's and o's. 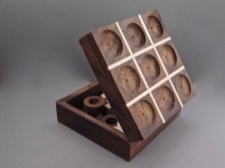 The top has small indented circles that holds the pieces in place. The box measures 4 x 4 x 1.75 inches. This easy to play, but universal game actually dates back to ancient Egypt. There are variations played all over the world using whatever materials are at hand. Have fun!